I have never been one of those girls who dreamed about her lavish wedding and knew every last detail about how the entire day would turn out. I am the kind of girl that looks at beautifully crafted gowns and imagines how I would look coming down the isle. I recently came across this gown and my eyes lit up. 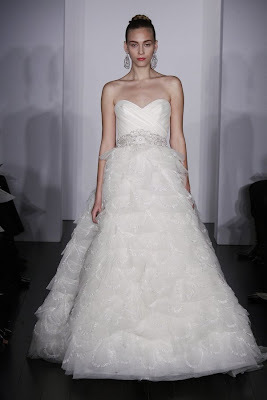 It is a strapless tulle gown with a softly draped bodice. It is designed by Kenneth Pool and it is undoubtedly out of my price range. Hey, a girl can dream! Posted by Taylor Sterling Labels: fashion.